The beautiful Robson Valley is bracketed by the Rocky Mountains and the Cariboo Range in north central British Columbia. This is the source of the Fraser River and the home of the famous Mount Robson from which the valley gets its name. Mount Robson is clearly visible from the Yellowhead Highway, and is the highest peak in the Canadian Rockies. 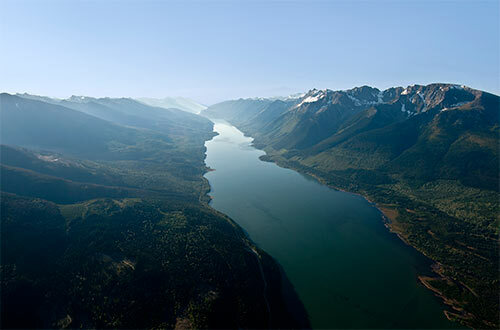 If you were to head high into the mountains here, you would find yourself at the origins of the Fraser River, which flows westerly through the valley and onward on its 854 mile trek to its final destination at Vancouver and the Pacific Ocean. The Fraser River is the lifeblood of the Robson Valley, providing fertile land, abundant water supply and plentiful fish stocks. Wildlife abounds with grizzly bear, caribou, and goats high on the hills; in the valley you will find moose, elk, deer, and many other species. Visitors travel to this area from all over the world to experience what the Robson Valley has to offer. The winters provide world-class conditions for skiing, snowmobiling and other winter sports; and the long warm summer days are ideal for all of your favorite outdoor activities including hiking, bird watching, ATVing and mountain biking.